Stepping onto the balcony, the warm Caribbean air rushed to meet us. Thick and muggy, it hung like a sugary sweet blanket; the scent of roasted breadfruit rising from the market below. 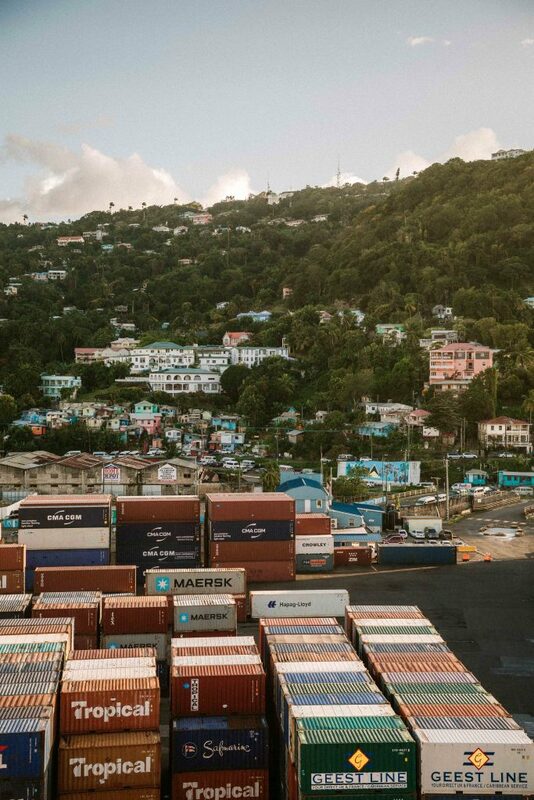 Ahead, the busy port of Castries appeared a rainbow of coloured shipping containers, the gateway to St Lucia sizzling in the afternoon sun. We had only just arrived in the bustling port, but would soon be leaving – the ship’s horn signalling that it was time to set sail. Our Caribbean Cruise aboard the mighty Azura was about to depart. Watching the turquoise waters foam and churn, I ran through our plans for the week. Embarking on our first ever cruise thanks to P&O Cruises, we were about to enjoy an entire week adrift in the Caribbean Sea. Joining the ship a little late, our fellow sea-goers had already visited the rainforested mountains of St. Kitts, the salt ponds of Grand Turk Island and the sugary soft beaches of Tortola. The north Caribbean islands now complete, the Azura had come to rest in St Lucia: its soaring bow visible from the island’s roads. 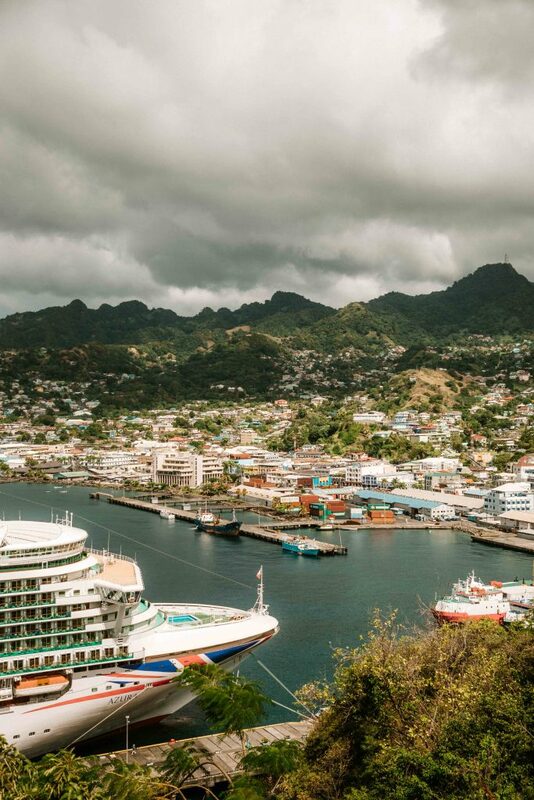 From St Lucia, we would continue on to explore the Caribbean’s more southerly residents, adventuring through Grenada, St. Vincent and Barbados. With no idea what to expect (aside from a handful of well-worn clichés), the Azura turned to face the waters ahead; the sun sinking below the watery horizon. Our 2019 Caribbean cruise was underway. If – like us – you have never taken a cruise, then I imagine the concept fills you with a mixture of curiosity and apprehension. Aged 32, we were also yet to dip our toes into the warm waters of the ‘cruiser’ lifestyle. Like many, it was a form of travel we assumed was simply reserved for the older generation – those who wished to see out their retirements whilst at sea: Sudoku puzzle in one hand, a cup of tea in the other. Indeed, I’ll be the first to admit that along with my long list of tired clichés and uneducated assumptions about cruises, I simply assumed that I was too adventurous, too cultured – too millennial – to take one. It’s perhaps therefore no surprise that when P&O Cruises contacted us to ask if we would consider taking a Caribbean cruise aboard the Azura – the third largest ship in their fleet – I hesitated. Was a cruise for me? Do young people even take cruises? Would I feel like I had truly experienced each port – each country? Yet, my initial reaction fading, I found myself intrigued. Maybe it was the temptation of seeing out the last few days of January in the Caribbean, or perhaps it was a rising awareness that I’d become the sort of (equally clichéd) traveller that only defined ‘real travel’ by the words ‘raw’ and ‘stripped-back’, but I found myself quickly responding to the email. 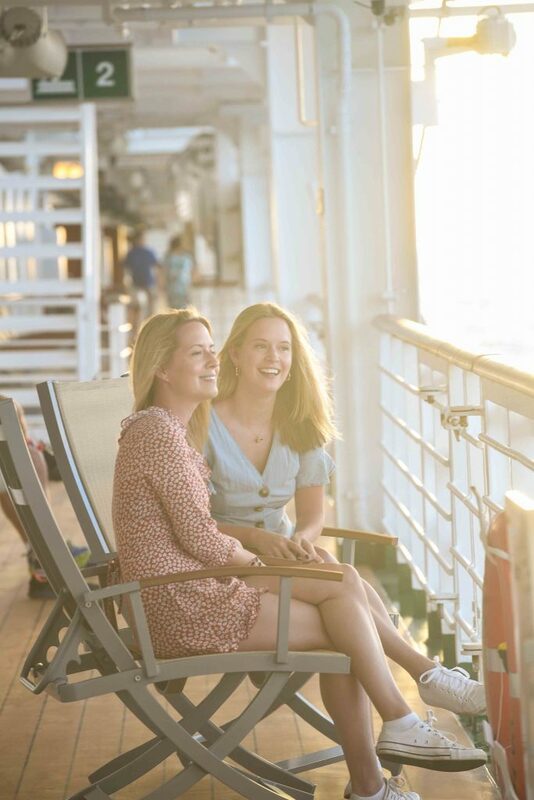 We would love to kick-start 2019 aboard a P&O Cruises Caribbean cruise. Which is the best P&O Cruises Route to Take? 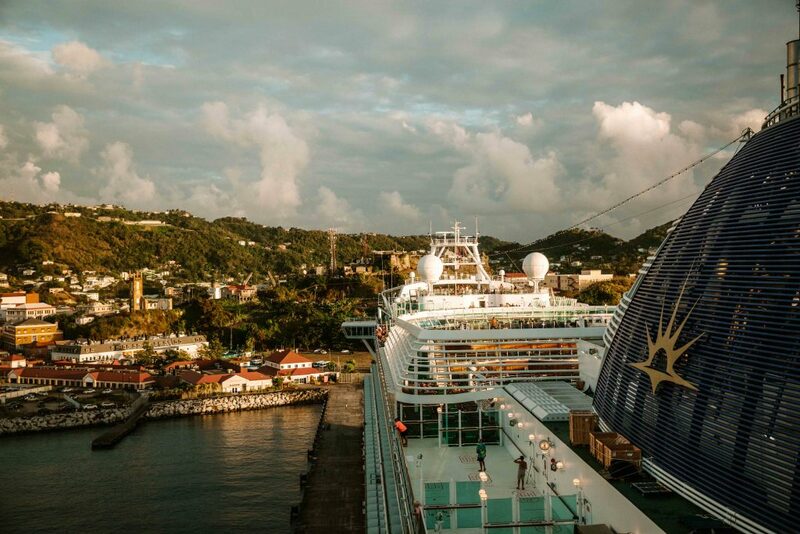 So, you’ve decided to take the leap and book a cruise. Yet no sooner have you made this decision than you quickly encounter your first hurdle: how do you decide which route to take? Are some better than others? Some more enriching? Others more relaxing? P&O Cruises offer a dizzying number of cruise routes. Whilst some traverse the cold waters of Alaska and Canada, others trace the historic shoreline of Nagasaki. Indeed, from vibrant Rio De Janeiro to magnificent Cape Town, ever-cool Sydney to Norway’s glassy fjords, you’ll find routes that suit both weekend-breakers and round-the-world adventurers. 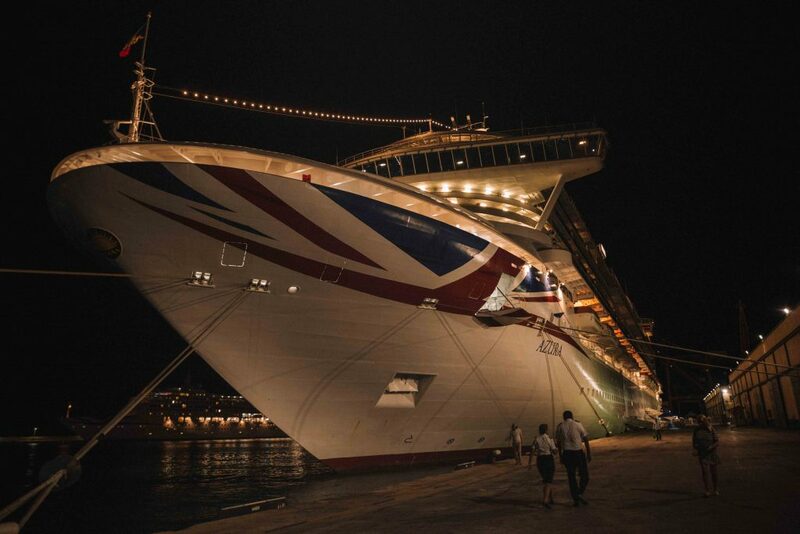 Lasting from just two days to over 100 days, P&O Cruises are not prescribed fortnightly events, but a mode of travel that can be tailored to suit your own preferences. Whether you’re after a quick European jaunt, or a lengthy exploration of South America, P&O Cruises have things covered. For those looking for a short (and frugal adventure), we were tempted by the Belgium cruise, which lasts just 2 days and sails from Southampton to Bruges (from £279 per person). For those hoping to explore more exotic destinations, P&O Cruises’ new Dubai and Arabian Gulf route is certainly worth a look (from £749 per person, including flights). The stop at Sir Bani Yas Island in particular looks more than a little tempting (with at least half of the island’s landmass covered by the sprawling Arabian Wildlife Park). One of P&O Cruises’ most popular route is their two-week Caribbean cruise aboard the Azura. It was also the route that we were lucky enough to experience. Visiting 9 ports: Barbados, Antigua, Grand Turk, Tortola, St Kitts, St Maarten, St Lucia, Grenada and St Vincent, this cruise is a laid-back exploration of topaz blue waters, lush volcanic islands and heady nights dancing at Caribbean street parties. It’s indulgent, relaxing and vibrant, filled with glimpses of nutmeg factories, jungle-esque national parks and hot-coal grills covered in freshly caught fish. As you’ll find, it’s also a route that we cannot recommend enough. (Prices for this particular route begin at £1,949 per person, including flights). Which P&O Cruises Ship to Choose? Perhaps naively, I hadn’t considered that when choosing a cruise, we might also select which ship to sail aboard. Despite the very obvious parallels with scoping and choosing hotels, it hadn’t dawned on me that a cruise afforded the same sort of choice. Indeed, you’ll find that each of P&O Cruises’ seven cruise ships not only come in different shapes and sizes, but boast different names, possess different personalities and even enjoy different God Mothers. (Our ship’s illustrious guardian is the famed dancer, Darcey Bussell. Although I imagine that this 115,000 tonne ship has very little in common with the nation’s favourite prima ballerina, it was still an oddly comforting thought). Less identical siblings, and more a family of diverse designs and experiences, P&O Cruises’ fleet offers something for every passenger. For example, whilst the majority of the fleet is family friendly, two of P&O Cruises’ ships are adult only: the Oriana and the Arcadia. Likewise, for those hoping to enjoy a spa treatment or two whilst away, then the Azura, Ventura and Britania come highly recommended. Furthermore, for anyone hoping to experience an intimate, classic cruise experience, then the Oriana (the fleet’s smallest ship) should be your vessel of choice. 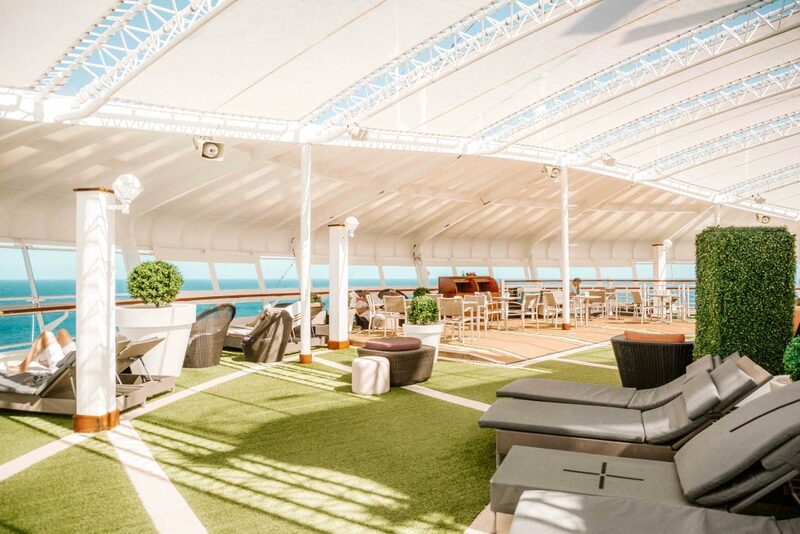 For those looking for an even more visionary experience, P&O Cruises’ new ship, Iona (soon to launch in May 2020), will feature a vast glass dome – offering glittering evening parties and spacious ‘conservatory suites’. Making her maiden voyage in the Spring, Iona’s brilliantly lit atrium will first take in the sights of the Norweigan Fjords. After establishing that we would be joining our 2019 Caribbean cruise in St Lucia, I momentarily paused. If the ship was there and I was here, how would we meet? There are several ways to join your cruise, each option allowing you to tailor your trip further. For most, the ‘fly-cruise’ is perhaps the most popular option. In short, this simply means that you fly from your nearest airport to the country in which your ship is docked. 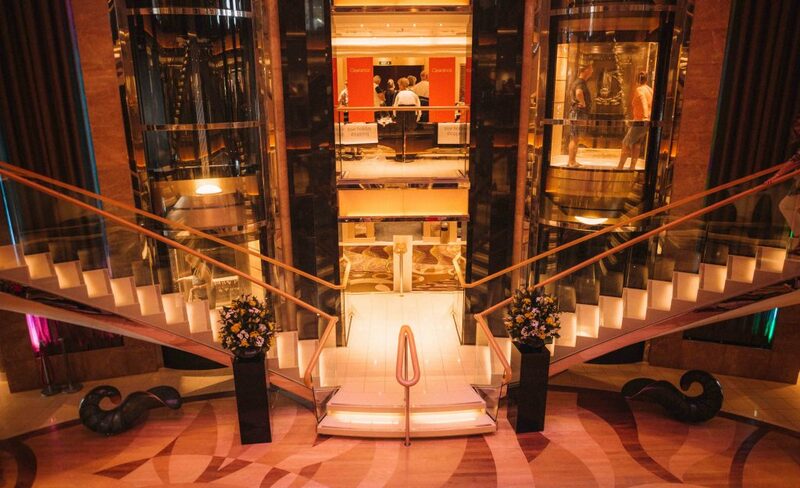 From here, you’ll be collected and transferred to your P&O Cruises’ ship. (Included in the cost of most P&O Cruises is the price of your return flights and transfer). When booking, you’ll also have the additional choice of flying via either a specially chartered flight (reserved for the express use of P&O Cruises passengers), or via an airline of your choice (also known as a scheduled flight). Whilst chartered flights are not operated for all cruise routes, they are incredibly convenient. Perhaps the only downside is that the selected airline may not provide the same level of service as your usual provider, e.g. limited travel classes and dining options. For our Caribbean cruise aboard the Azura, we opted to fly out on a scheduled flight operated by Virgin Atlantic, and flew home via a P&O Cruises chartered flight, with Thomas Cook Airlines. The flight home was uncomplicated and easy; featuring a well-organised transfer to the airport, where we passed quickly through customs thanks to previous onboard checks. Alternatively, for those who wish to truly embrace the onboard experience – gaining both your sea legs and daily lungfuls of sea air – then you might wish to join the ship at Southampton, sailing to your chosen destination. Indeed, for many (particularly those on the Caribbean cruise), it is this journey across the cold Atlantic waters that truly encapsulates the cruising experience. Also known as the ‘no-fly’ option, this is a fantastic alternative for those who wish to start their adventure as they mean to go on: all at sea. What are the P&O Cruises Cabins Like? When conjuring up images of our cabin aboard our P&O Cruises Caribbean cruise, I drew inspiration from my two closest cruising experiences: the films ‘Titanic’ and ‘Pirates of the Caribbean’. Yet in reality, 0ur cruise with P&O Cruises had absolutely no parallels with either film. Indeed, there were no nineteenth-century inspired cabins, nor any swashbuckling Orlando Blooms. Whilst each P&O Cruises ship offers slightly nuanced designs, all cabins possess the same high level of standard and comfort. From extravagant suites, to the ‘pocket-friendly’ indoor cabins, there is accommodation to suit every budget. 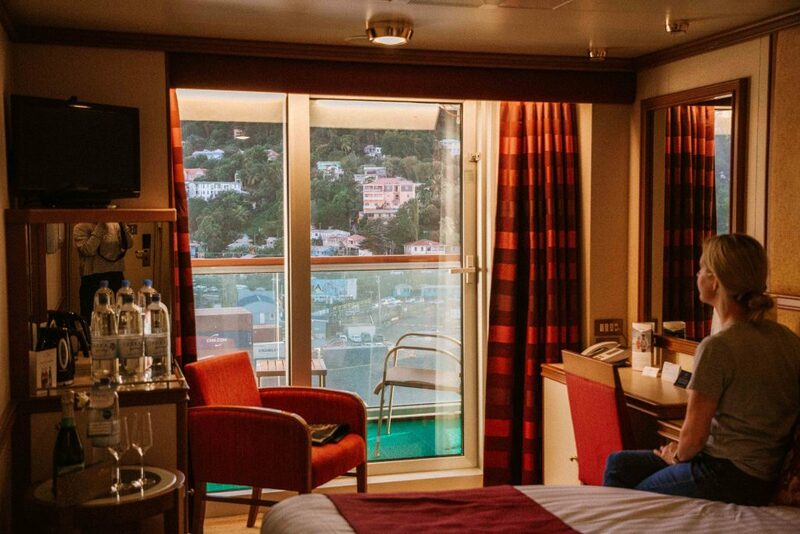 We were lucky enough to enjoy the use of a Balcony Cabin: with floor to ceiling glass doors leading out onto our own private terrace. Ranging from 178 – 237 sq ft (including balcony space), our own Balcony Cabin featured a sitting area with desk, armchair and TV, a large balcony, two single beds, a separate area to store clothes and a bathroom with toilet and shower. I was genuinely surprised by how spacious our room was. Fully air-conditioned and cleaned twice a day, we had room to sleep, work, relax (on the reclining balcony chairs) and an entire dressing area to store clothes and bags. Although the decor might not be the most modern (it felt more cosy than stylish), the cabins aboard the Azura are due to be refurbished within the next two years. Our room also came complete with heavenly White Company toiletries, mineral water, beach and personal use towels, a hair dryer, fridge and plenty of charging points (note: these are British plug sockets, so no need to bring your adapter). Additionally, our cabin was unbelievably quiet. 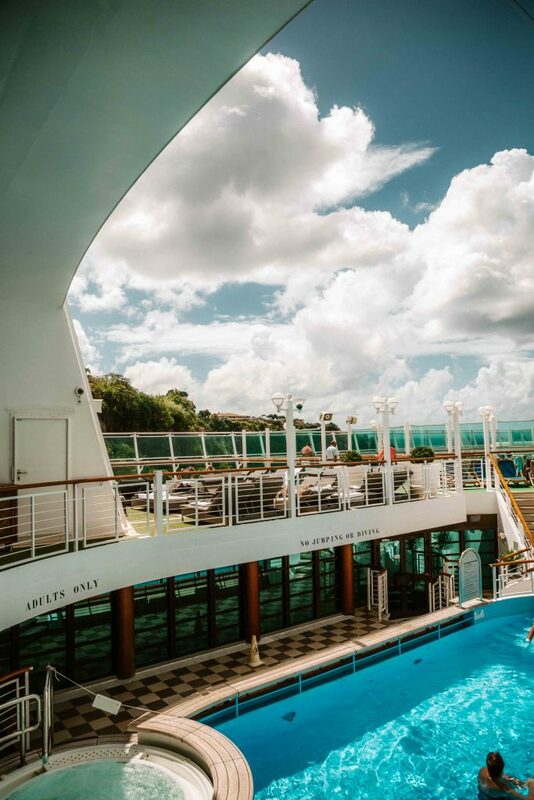 A notoriously terrible sleeper, I slept soundly each night of our Caribbean cruise aboard the Azura (which is nothing short of a modern day miracle). Perhaps it was the gentle undulation of the waves, or the serenity of being at sea, but I’m yet to enjoy another sleep like it. In short, P&O Cruises cabins aboard the Azura were little different to traditional hotel rooms. Spacious, clean and with plenty of free provisions and amenities, our cabin was far from my Titanic-inspired nightmare. Too often, cruises are hastily lumped together with the wider ‘all-inclusive’ holiday; a category that regularly comes under fire from tired travel snobbery and bias. This is particularly so when it comes to the subject of dining. Indeed, unless you’re enjoying an authentic meal – cooked by firelight in a yurt – travel critics tend to suggest that your dining experience is somehow lacking; an inauthentic taste of travel. It is not a bias I agree with – and one I’d certainly argue against following our P&O Caribbean cruise aboard the Azura. Now, before we start, let me cover the topic of dining plans. 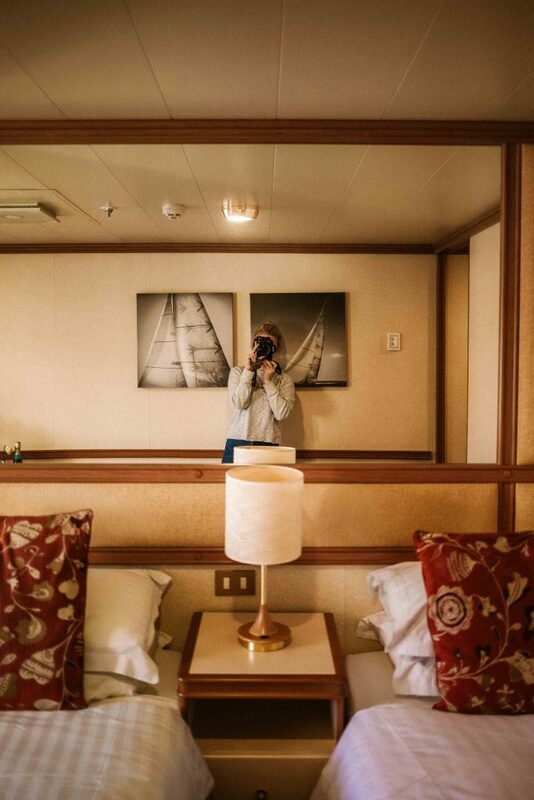 Joining a cruise as an entirely inexperienced novice, it was a little like joining a new organisation: unfamiliar acronyms and procedures quickly confusing me. The dining situation was certainly one of these instances. When booking your cruise, you have the option to choose from ‘Club Dining’ or ‘Freedom Dining’. Club Dining is more restrictive, requiring you to dine at a set time each evening – and at the same table. This is the more economical option and therefore widely popular. Alternatively, you can pay a little extra for the ‘Freedom Dining’ package, which comes with no fixed dining time or table. Included in both packages is the option to dine for free at three main restaurants: the Meridian, the Peninsula and the Oriental. Other casual dining options are also available for lunch, with breakfast being served in both the Verona and Venezia restaurants. Dinner at these restaurants is a sociable affair: allowing you the option to be seated on a shared table (so that you can mingle to your heart’s content), or to be seated alone. In these restaurants, you are able to choose from a set menu, incurring an additional cost for drinks and wine. Food and service in these restaurants is prompt and enjoyable, although the menus are perhaps a little conventional and evidently tailored for the British palette. As such – and for those looking for a more ambitious menu and memorable dining experience – then we would highly recommend visiting the Azura’s ‘Select Dining Options’. Importantly, these restaurants are not entirely free; requiring you to pay a modest service charge for each meal (between £5 – £15 per head). Yet, the cost is entirely worth it. On our first night, we ate at the fantastic Sindhu; a restaurant offering authentic Indian cuisine. Opting for an aromatic curry – filled with turmeric and chopped cashew nuts – and piles of freshly baked naan bread, we thoroughly enjoyed our introduction to Cruise ship dining. Throughout the week, we also visited the sophisticated Epicurean Restaurant; a hushed space in which dinner is an indulgent, drawn-out affair. Over plates of succulent monkfish and glasses of ice-cold Pinot Grigio (you can view the restaurant’s menu here), we dined like true foodies; no hint of the ‘all-inclusive’ curse to be found. However, and without hesitation, we were most impressed by the fantastic and relevant Glass House restaurant. The vision of the award-winning wine expert and passionate foodie, Olly Smith, The Glass House is a restaurant dedicated to P&O Cruises’ budding sommeliers; those who wish to sample some of the globe’s best wines, over fusion-inspired dishes. Over endless ‘Mini and Mighty’ plates of aromatic lamb skewers, fleshy and sweet Tempura prawns, and an explosive Thai Beef Salad, we were advised on which wine to enjoy with each dish. In fact, so good was our experience that we dined here twice. A sample taster menu for the restaurant can be found here. Alongside these dining options, there are also eight different bars in which to enjoy a drink. From the American-inspired Brodie’s bar (featuring an impossible amount of different beers), to the relaxed ‘Blue Bar’, there are plenty of drinking holes to wile away your evenings. Drinks Packages: a quick note on drinks. Aside from water and breakfast drinks, you will be expected to pay for any other beverages whilst onboard. Whilst you can pay for these individually (they will be charged to your cabin), you can also plan ahead and purchase a Drinks Package, to economise things a little. I had heard whispers of the dress codes demanded by cruises; vague notions that I’d be drinking a beer whilst wearing a sea-blue ball gown filling my head. Indeed, I assumed that I’d pass swimming pools surrounded by male passengers in tuxedos, and women strutting in towering heels. It had been these myths – these cultish whispers – that had perhaps only fuelled my cruise-related apprehension. However – and perhaps predictably – once aboard our P&O Cruises Caribbean cruise, these whispers were proven to be entirely fictional. Throughout the day, guests are able to dress entirely as they wish. Heck, I spent one morning walking the ship’s promenade in just a bikini. Furthermore, in the evening you are simply encouraged to opt for a ‘smart casual’ option, which is little different to how I’d dress for a meal out when travelling. However, there is one night – one cherished date in the cruise calendar – that requires you to shake out those dresses and reach for the hairspray: the Black Tie night. Initially, I assumed that this evening entailed all 3,000 guests heading to the same grand ball. However, I quickly realised that although a little dressed up, guests simply continue as normal – dining where they wish (albeit all whilst looking fabulous). When beginning our Caribbean cruise aboard the Azura, I felt a vague reticence about the Black Tie evening. Would I feel ridiculous eating an Indian meal whilst wearing a pretty dress, complete with lashings of mascara? Would it all feel a little contrived, a little – well – awkward? However, as the evening neared, I found myself getting increasingly excited. Ladies were booking in at the onboard salon, whilst men were sending their suits away for dry cleaning. It was as though a heady party loomed on the horizon: a 21st birthday or New Years’ celebration, perhaps. As dusk fell the night of the Black Tie event, guests disappeared a little sooner from the poolside; hair dryers firing and showers running. Applying perfume in our room and styling our hair, Claire and I found the excitement strangely irresistible. We were perhaps even giddy at the prospect of joining our fellow diners for a night of old-time glamour. Walking the promenade to the restaurant – passing guests wearing red silk gowns and little black cocktail dresses – the Black Tie night was an oddly collective experience, ensuring that all guests felt part of something special; smiles wider and laughter that little bit louder. It was a thoroughly enjoyable experience, and one I’d urge you to enjoy. Once you’ve booked and confirmed your P&O Cruises holiday, you’ll be sent an itinerary. Detailing each port and overnight stay, you’ll also notice that your schedule features one or two ‘sea days’. 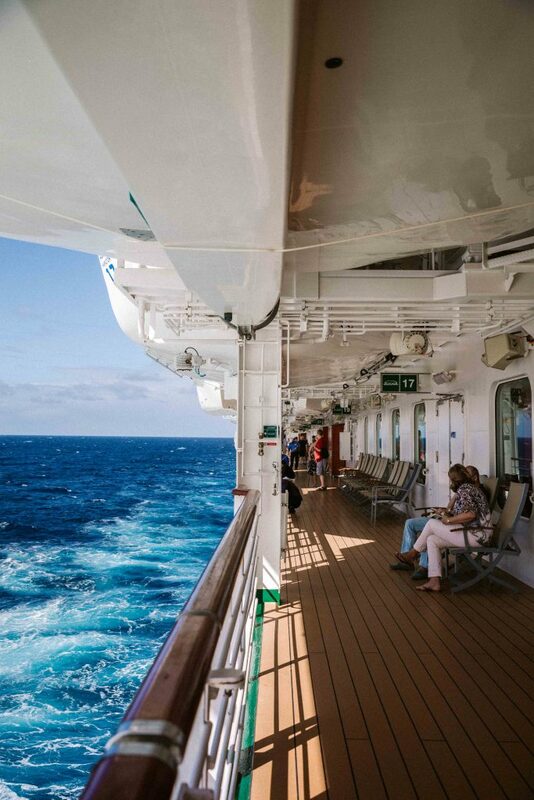 An entire day at sea – no getting off, no jumping ship. It was an idea that initially unsettled me – a prickle of claustrophobia crawling up my neck. What would it be like spending an entire day aboard a ship? Whilst at sea? How would we fill our time? 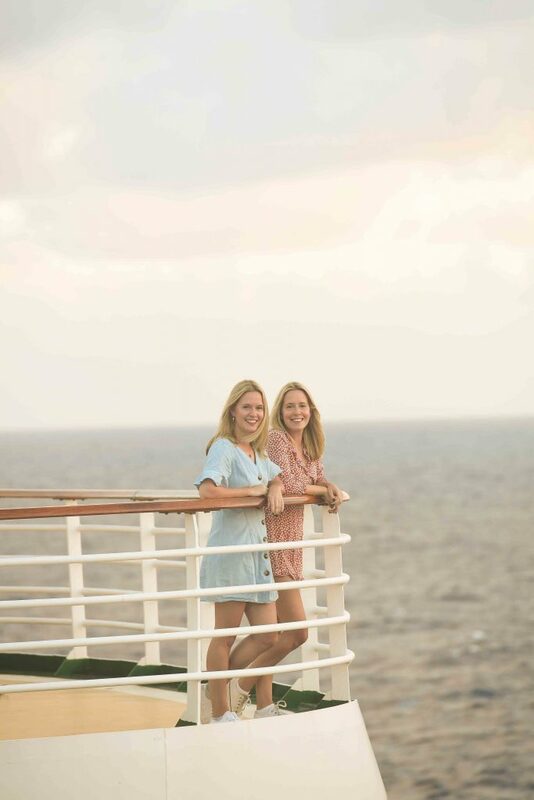 However, the moment we began our Caribbean cruise aboard the Azura, my anxiety disappeared. Despite 3,000 passengers and 1,200 crew members, the very vastness of the ship means that it’s also possible to walk corridors and promenades without seeing another soul. 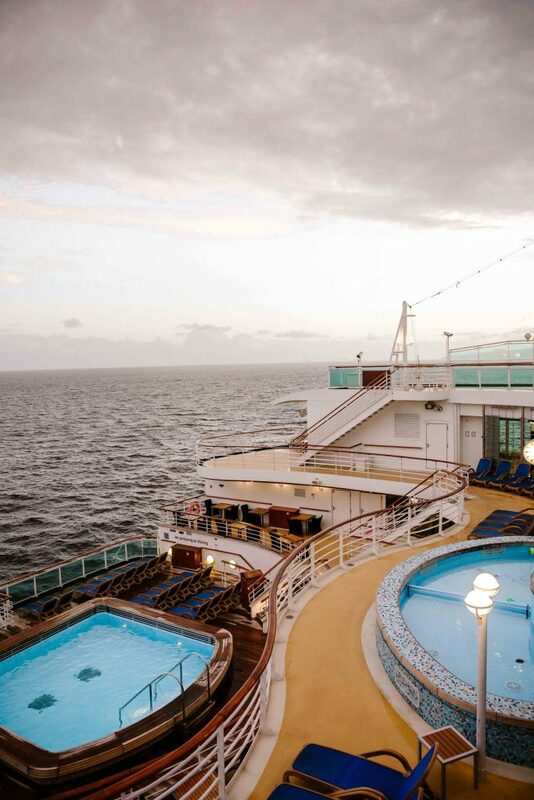 Onboard, there are a wide selection of facilities able to keep even the busiest of minds occupied. Included in the price of your booking is access to the ship’s four pools, the gym, the library, the theatre, a large screen cinema room, sports courts, a small shopping mall and an art gallery. Furthermore, on sea days, additional activities are also arranged, including painting and dance classes, shuffleboard games and guest speakers. For those happy to pay a little extra (as we did), we arranged a visit to the ship’s excellent Spa, each opting for a Thai massage. After, we reclined in the small pool next to the spa area; drinking cocktails and thoroughly enjoying our day surrounded by the sparkling waters of the Caribbean. It’s perhaps important to note that unsurprisingly, the pool areas get very busy during sea days. Indeed, with the Caribbean sun high in the sky, it’s unlikely that many would opt to spend their day inside. With this in mind, we decided to book a day at The Retreat: an adults only area found on the top deck. Featuring an alfresco terrace, luxury beds, access to free meals and fruit, and boasting shaded cabanas, the Retreat is a veritable cruise ship oasis. Costing £30 per day, access to The Retreat is a little costly. Yet, given that we had just one sea day, it was absolutely worth it – providing us with somewhere calm and peaceful to spend our sun-drenched day. Armed with books and lemon-infused water, we wiled away the hours beneath a billowing canopy; enjoying 360 degree views of the sparkling ocean. I’ll be the first to admit that I tend to steer clear of onstage, live entertainment. Something about it makes me feel a little bit anxious; the possibility of being pulled onto stage – blinking underneath a spotlight as I’m forced to complete an Irish jig – would be a fate worse than death. However, evening entertainment is indeed part-and-parcel of the cruiser lifestyle; an inherent aspect of life at sea. It therefore seemed a little short-sighted to avoid it entirely. With five entertainment venues to choose from aboard the Azura, there is an awful lot to experience each night. From cabaret shows to a Bruno Mars impersonator (who, might I say, was fabulous), the evening entertainment on our Caribbean cruise was glitzy, grand and surprisingly brilliant. In particular, we really enjoyed a visit to the ship’s outdoor cinema (or Sea Screen), found on the Aqua Deck. Here, underneath the twinkling lights of Grenada, a small crowd gathered to watch ‘Bohemian Rhapsody’; popcorn and drinks in hand. Additionally, a new and dazzling show designed by Jonathan Wilkes and Stephen Mulhern, made its debut whilst we were onboard. In fact, so popular was the show that the queue nearly backed out the door. As a self-confessed introvert – someone who prefers a quiet dinner and a glass of wine – I was a little nervous about what the evening entertainment would be like aboard our Caribbean cruise. However, after a week experiencing both dazzling shows and quiet evenings walking the ship’s promenade (with just a Gull or two for company), I was left assured that cruises don’t have to mean endless jazz-hands or audience participation. Instead, evenings can be as loud or peaceful as you want them to be. Can a P&O Cruises Holiday Offer an Enriching Travel Experience? Perhaps the biggest concern amongst cruise novices – and indeed determined travellers – is whether or not this mode of travel can offer a truly enriching experience. Seemingly confined to your ship – like sunburnt prisoners – it’s suggested that being on a cruise offers only the slightest taste of the islands and cultures that you sail past. So, how much ‘travel’ do you really experience aboard a cruise? Or is it simply all cocktails and pool days; sanitised excursions and experiences? Firstly – and perhaps most importantly – planned excursions are entirely optional. Indeed, as soon as you dock in a new port, you can simply leave the ship and walk off into the sunset (albeit returning for that 5pm curfew). Enter the cruise terminal and you’ll find that each port is filled with local guides and taxi drivers, each willing to take you on your own independent adventure. As such, each day is your own – and it is up to you to decide how to fill it. 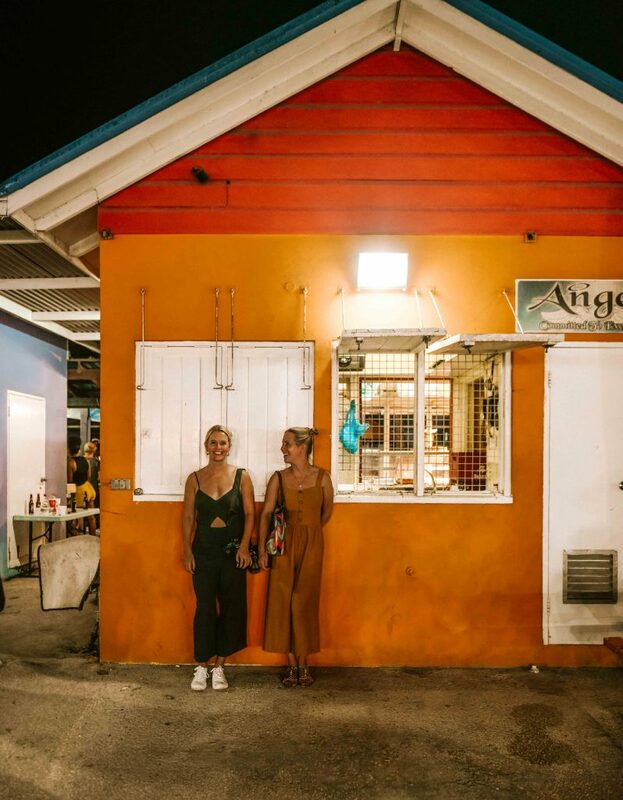 Whether you simply decide to stay local – exploring the port town and indulging in some local cuisine – or whether you travel to the other side of an island to witness a tumbling waterfall, the choice is entirely yours. 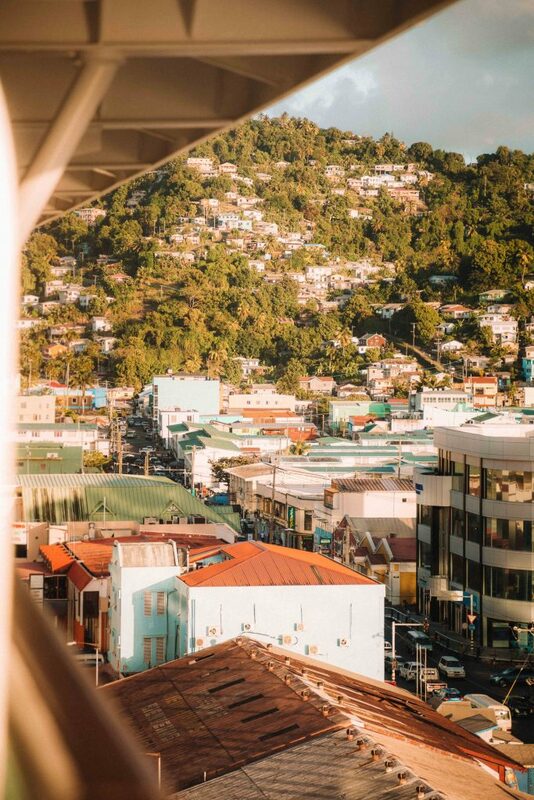 When docking in St Vincent, it was this form of ‘independent’ sight-seeing that we opted for. After finding a taxi driver, we took a short tour of the island, with our new friend taking us to some of his favourite spots, including a local restaurant for lunch. It was absolutely no different to how we would normally travel or explore a new country, and was a day that we thoroughly enjoyed. When receiving your P&O Cruises itinerary, you’ll notice that you can book a number of excursions throughout your trip. Importantly, the cost of the excursions are not included in the original booking fee, therefore you’ll need to allocate additional spend for these. With each country and island offering the choice of nearing 20 different excursions, it was a little overwhelming when deciding which to select. 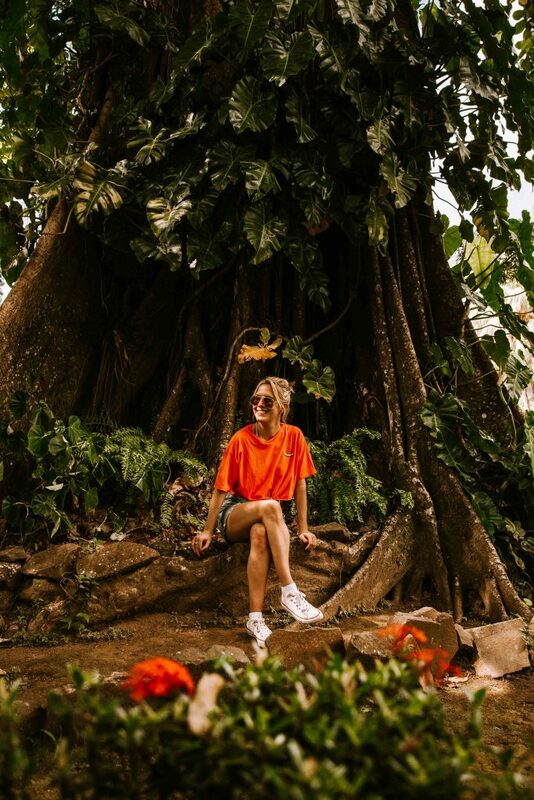 From entire days at sea aboard a catamaran, to water tubing; from tours of spice factories to lagoon diving, each excursion was detailed, elaborate and meticulously planned. 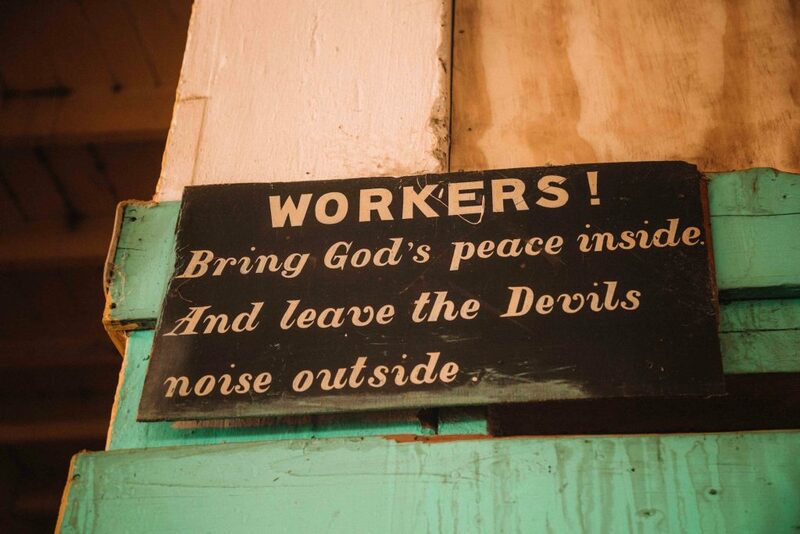 Indeed, had we not booked onto two of them during our own Caribbean cruise aboard the Azura, we might have missed some of the area’s most beautiful and historic parts (the oldest nutmeg factory in Grenada, for example). Excursions range from £24 – £105, dependent on the length of the activity. Ultimately, whether you decide to join an excursion or not is entirely your choice. If you are an independent traveller who baulks at the idea of an arranged tour, then simply navigate your own path. Or, for those looking for an organised, no-hassle approach, then we can testify to the fact that the P&O Cruises excursions are well worth their money. 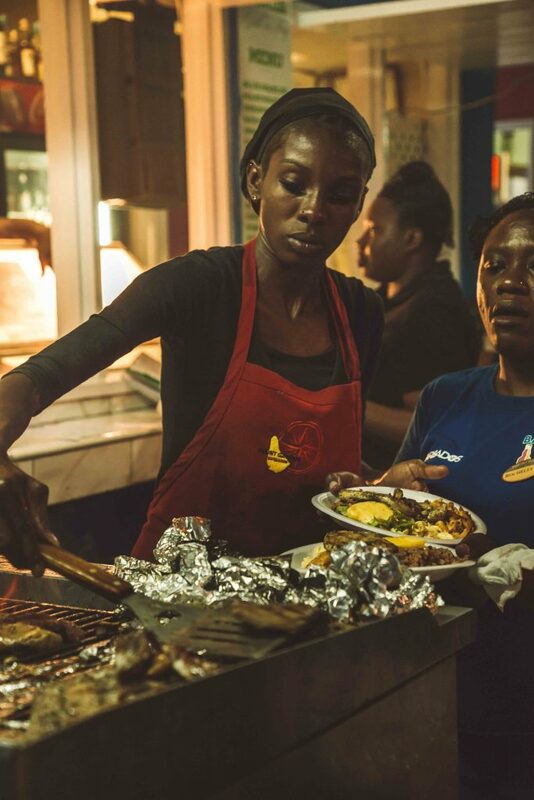 Of course, with the ship leaving port at 5pm every day, it’s possible that you might feel a little robbed for time; able to sample just a taste of what a particular destination has to offer. In order to remedy this, P&O Cruises have introduced the ‘City Stay’ option, as part of their ‘fly-cruise’ holidays. Although not available on all routes, this flexible alternative allows passengers to add a local hotel to their booking, so that they can explore a city either before or after their cruise. So, if you cannot tear yourself away from Venice’s arching bridges then fear not: the City Stay option is on hand to buy you some precious added time. Importantly, money is not accepted aboard P&O Cruises. Instead, all purchases are charged to your account and payable on departure. We found that this made things incredibly easy – although we did ensure that we asked for a statement each evening, to avoid total financial disaster. WiFi is also available on board, and is offered at three tiers. The Connect Package (£7.75 for 24 hours) offers basic browsing, allowing you to access social media and messaging services. The Browse Package (£12.50 for 24 hours) (which we opted for), provides the same access as The Connect Package, but allows you to browse emails and use search engines. Lastly, the The Works (£24.95 for 24 hours) allows users to stream sites such as Netflix and Spotify, with access to WiFi calling options, such as FaceTime. We found that The Browse Package suited us well, allowing us to upload images to Instagram, along with stories (although we did find that the Instagram Stories were often pixelated due to the weaker satellite signal). 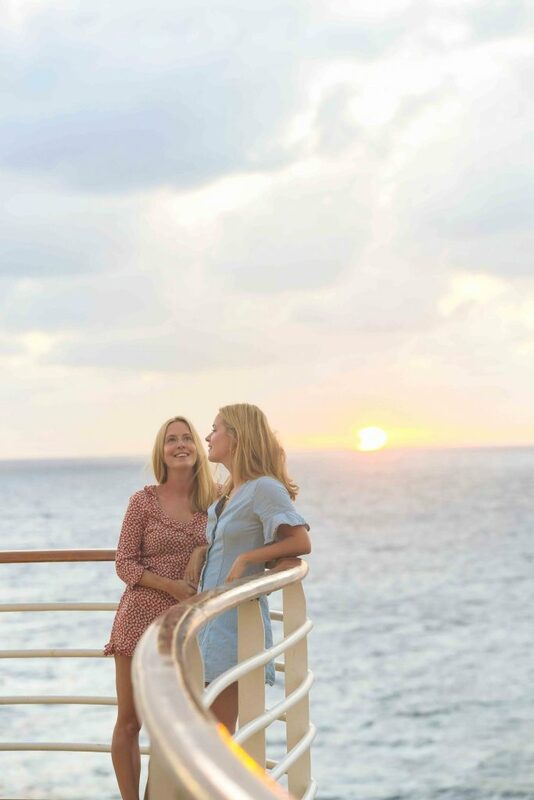 As the old adage goes: cruising is for the older generation. The simple answer is both ‘yes’ and ‘no’. Throughout our Caribbean cruise aboard the Azura, it was apparent that the demographic was largely dominated by older guests and families. However, given that this was mid January – schools and businesses now in full swing – this was perhaps unsurprising. Having spoken to other guests throughout our stay, it seems that the age range of your average cruiser shifts and changes, dependent on the time of year. Cruise throughout the summer, for example, or during the Christmas holidays, and you’ll find many more young families and couples joining ranks. Take a trip in the middle of September, however, and you’ll find yourself largely surrounded by the footloose and fancy free. One thing that did strike me was the sheer number of families enjoying multi-generational holidays. From great-grandparents through to new borns, the ship was filled with family units enjoying a multi-destination experience that perhaps only a cruise holiday can offer. 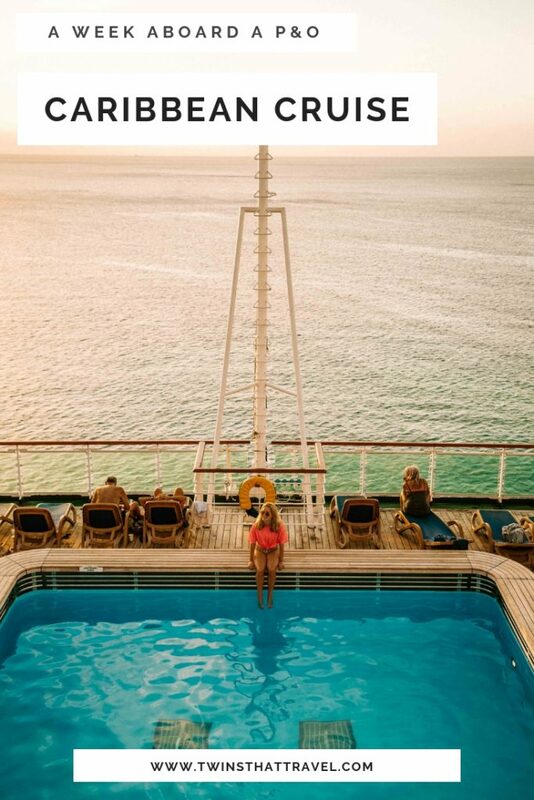 Of course, cruising will no doubt remain a form of travel favoured by the older generation; those looking to see the world in relative comfort and security. But must that mean that younger people should be discouraged from cruising, or should assume it is a somehow lack-lustre way to see the world? Absolutely not. That there are stigmas surrounding cruising is undeniable, but – and as any dedicated traveller should know – dispelling these sorts of cliches is what makes travel so rewarding. Lastly, and something I thought of often whilst on our Caribbean cruise aboard the Azura, was the environmental impact of cruising. Given that the majority of these ships burn heavy fuel oil, they are considered to be large-scale pollutants; each adding to a guest’s carbon footprint. To tackle this, P&O Cruises have announced that their next two ships – Iona and its twin ship – will be powered by LNG (Liquified Natural Gas). Currently the most environmentally-friendly power source for large ships, P&O Cruises have pledged to continue to innovate and reduce their carbon emissions (which they have already done by 24%), whilst updating their engines. While aboard our cruise, we also learned that P&O Cruises are banning single use plastics from their ships by 2022. Although – and like much of the travel and aviation sector – there is long way to go before this mode of travel is considered ‘clean’ and environmentally neutral, I did feel reassured to hear of P&O Cruises’ future plans. On the final night of our cruise, we sat on our balcony in content silence. The shallow, clear waters of Barbados stretching out ahead of us, we watched as the sky turned from a blushing pink, to a bruised purple – magnificent frigatebirds skimming the water’s edge. The warm breeze circling us, I tried to cast my mind back to just six days previous. What had I expected from our P&O Cruises Caribbean holiday? Of this trip? Of this adventure? Often unfairly characterised as an unadventurous form of travel – one that you turn to when your wilder days are behind you – perhaps I had seen this trip as more of an indulgence, than a ‘real’ adventure. Looking back, I am perhaps glad that I had bought into these cliches and assumptions. Proving that the cruiser lifestyle does not have to mean stale entertainment, or cursory glances at pastures new, our 2019 Caribbean cruise was perhaps one of our most surprising adventures yet. From roaming the orchid-filled gardens of St Vincent, to dining on succulent monkfish and scallops in the atmospheric Glass House restaurant, our cruise came as a satisfying wake up call: a trip that reminded me that worthwhile adventures should not be measured only in how remote, difficult or local the experience is, but in how it makes you feel. And with that in mind, P&O Cruises are perhaps the biggest adventurers of them all. Thank you to P&O Cruises for the opportunity to enjoy our first cruise holiday. Although this trip was part of a paid partnership with P&O Cruises, all views expressed here remain our own. "5 Ways to Deal with an Anxiety Relapse"
This is such a great post and fantastically detailed! I’m going on my first cruise in April, despite having always said that cruises are my worst nightmare and I’d never go on one! My main concern is not having time to really enjoy an island, and feeling time restricted all the time, along with places being crowded when everyone is disembarking the ship at the same time. Wonderful. Loved your post. Beautiful you both and the pictures.